This picture shows a dorsal view of the respiratory organs of the pig (removed from the thoracic cavity; the heart is on the opposite, ventral side). 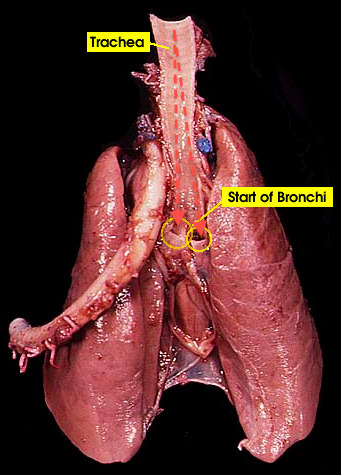 The trachea has been cut in half along its long axis so that its interior surface, cartilaginous rings, and bifurcation into the two bronchi are visible. The aortic arch and the aorta are to the left of the trachea and the aorta has been cut distally where it would ordinarily pass through the diaphragm (not shown).